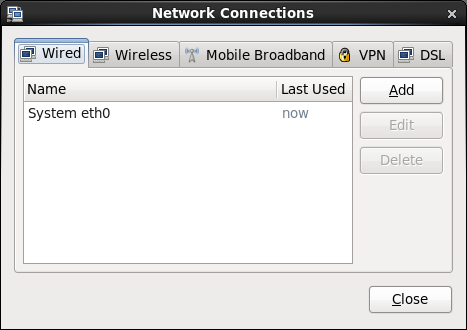 The NetworkManager service, Gnome graphical applet, and the nm-connection-editor command are included in the NetworkManager package. The system-config-network utility is included in the system-config-network-tui package. The NetworkManager service dynamically detects and configures network connections. It includes a GNOME Notification Area applet (nm-applet)that provides you with information about the network status and graphical configuration tools to manage network interfaces and connections. The applet icon changes its appearance indicate the state of the network. Hover the mouse pointer over the icon to display more information as a tool tip. Clicking the icon displays a drop-down menu that allows you to restart or disconnect each named interface. Allows you to stop or start the network service. Controls whether NetworkManager notifies you of changes to the status of network connections. Displays the Connection Information window, which lists the connection type, hardware address, IP address, and other useful information for each interface. Displays the Network Connections window, which allows you to configure wired, wireless, mobile broadband, Virtual Private Network (VPN), and Digital Subscriber Link (DSL) interfaces. You can also open this window by using the nm-connection-editor command. Figure 11.1 shows the Network Connections window with the Wired tab selected. You can also use the system-config-network command, which provides a text-based user interface that allows you to configure network interface and DNS resolver settings.